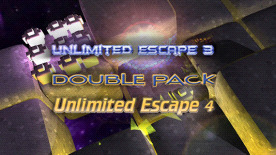 Two new versions of Unlimited Escape in one bundle! Our hero arrives at the beginning of a new adventure, this time immersed in deep space with new unknowns and news! The protagonist of the game will walk and explore endless mazes procedurally generated and will have a single mission: to save the prisoners scattered in the path leading them to the point of rescue. The setting has been completely renovated. Now our hero will walk in space scenarios immersed in the galaxy, with new emotions and feelings! This time the random paths have been simplified and ramps are floating in space with the danger that the protagonist and the prisoners fall into the void. All this brings new difficulties and emotions! The gameplay was changed once again, with new and more fluid guidance system of the prisoners. This system leaves much more freedom of action. Now the prisoners are guided taking selected the point of grouping and moving it freely. The coupling distance has been reduced to a more realistic! The types of enemies have been doubled: now there are ten types! Each type has its behavior and its speed, as well as its resistance to gunfire. New types of enemies follow the protagonist even if the Point Group is active! It gets harder! Each level has some important news: mobile platforms. These platforms floating in space will give more life and difficult in the paths of our hero. The big news of this version of the game are bonuses, created in a unique way! These bonuses are movable objects placed randomly in different levels, can be moved by the protagonist and represent a protection from enemies, who will die in collisions with these items! In this way, the gameplay is more diverse with new hideouts and tactics. All these innovations make “Unlimited Escape 3? a game more and more unique, fun and endless !! “The Arena” is a variant of Unlimited Escape 3 with many new suggestions! The protagonist of the game will walk and explore endless mazes procedurally generated and will have a single mission: to save the prisoners scattered in the path leading them to the point of rescue. “The Arena” is a variant of Unlimited Escape 3 with many new features! Mobile platforms have been increased! The obstacles are subjected to gravity and simply obstruct the path of enemies. There are lethal holes in the map! The lighting effects have been improved!